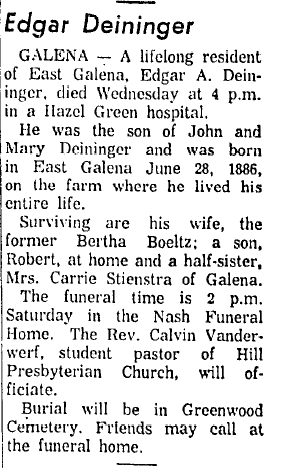 This is the obituary for Edgar Deininger, son of John and Mary (Nadig) Deininger. Originally published in the Freeport Journal-Standard, Friday, 27 Feb 1959, page 6. Edgar is buried in Greenwood Cemetery in Galena, Illinois, with his wife and son. GALENA – A lifelong resident of East Galena, Edgar A. Deininger died Wednesday at 4 p.m. in a Hazel Green hospital. He was the son of John and Mary Deininger and was born in East Galena June 28, 1886, on the farm where he lived his entire life. Surviving are his wife, the former Bertha Boeltz; a son, Robert at home and a half-sister. Mrs. Carrie Stienstra of Galena. The funeral time is 2 p.m. Saturday in the Nash Funeral Home. The Rev. Calvin Vanderwerf, student pastor of Hill Presbyterian Church, will officiate. Burial will be in Greenwood Cemetery. Friends may call at the funeral home.